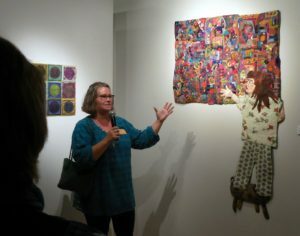 I’m flummoxed but grateful that my piece, Swimming Upstream, was juried into the show, Connected by Stitch, the first Pennsylvania regional show by the international Studio Art Quilt Associates (SAQA) at The Gallery at Penn College for the next 6 weeks. And I feel privileged to be among some mighty fine fabric artists. Let me share just a few of my faves in this show. 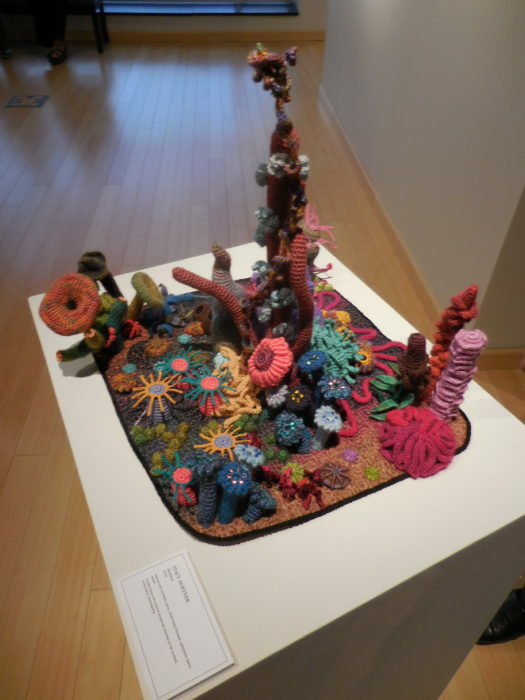 I loved this little underwater paradise, a colorful, crocheted coral reef on a bed of quilting. It’s by Stacey Hortner. She’s since made this in monochromatic beiges, to express her concern over the bleaching of coral reefs, due to the massive amounts of CO2 mankind has imposed. Another fun piece, with a message, is this one by Peggy Hracho. It’s got an abundance of felting, embroidery, quilting. 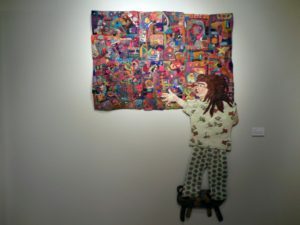 The little girl is exhorted to “go for it,” i.e., touch the art quilt–something most quilt venues don’t allow. Very exciting for departing from the usual shape and look of a quilt, is by Meredith Re Grimsley. 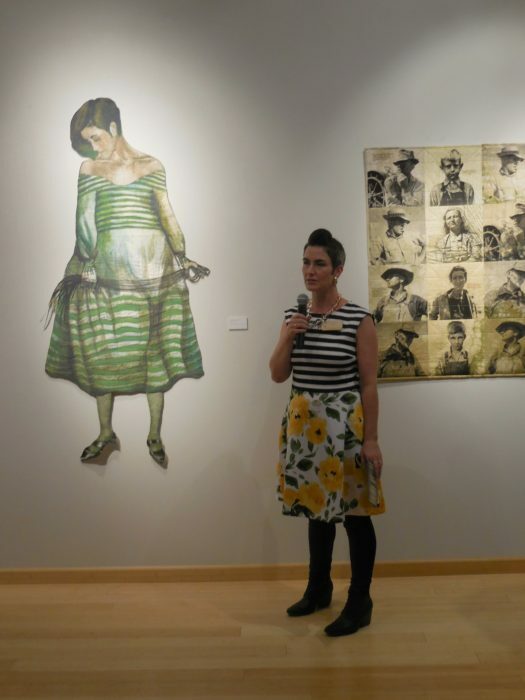 It’s a life-size self portrait, painted and quilted, remarking on the fact that the dress no longer fits; the artist now occupies a different place in her work and in her life. Finally, before I hit the sack, gotta launch one more photo, a ship by Meredith Eachus Armstrong. 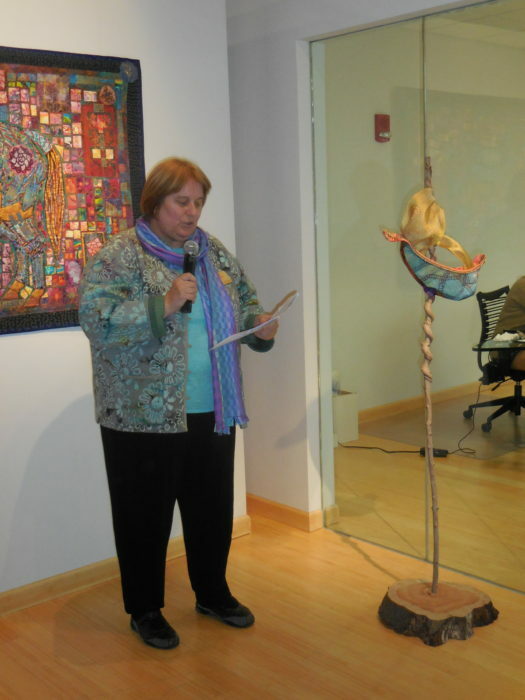 Fabric and wood, sculpture more than quilt. This Meredith, more than any other Meredith or any other person, is responsible for making this wonderful show happen. 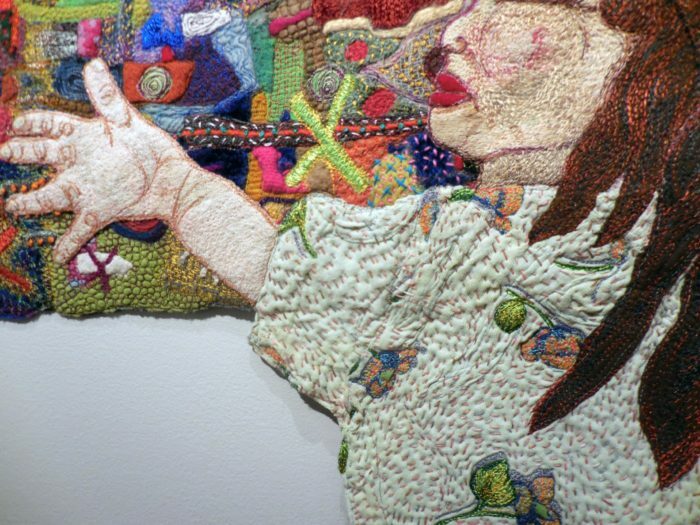 Kudos to her, from me and everyone who agrees that non-traditional contemporary quilt art really floats our boat. 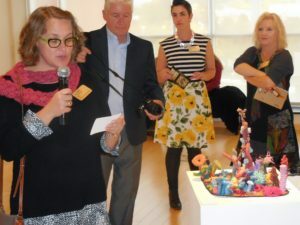 This entry was posted on Sunday, October 23rd, 2016 at 3:26 am	and is filed under Art + Quilt, Exhibitions, Inspiration, Personally Speaking, Recycled Art, Unusual Materials. You can follow any responses to this entry through the RSS 2.0 feed. You can leave a response, or trackback from your own site. Thanks for the shout out Elly!! It was a fun day, and the show looks great. Great to get to know you and your amazing work! 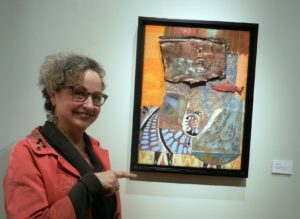 Congratulations, Eleanor, I love your piece, and thanks for sharing all the other fantastic pieces, too. That one with the girl stroking the quilt is so brilliant! Ellie, your work is wonderful. Can you explain what the meaning behind the piece is? I only ask because your work is always more than what you see. Many layers, literally and figuratively.